Everyone is familiar with popular Seattle greenspaces like Alki Beach Park, Discovery Park and Volunteer Park. It’s a little-known fact, however, that there are pint-sized, yet breathtaking secret parks dotted throughout the city. These are some of Seattle’s best secret parks. This gem is tucked away next to the I-5 on-ramp in North Seattle. On a clear day, you’ll see spectacular views of the downtown skyline, Green Lake and the Olympic Mountains. Everyone can enjoy this park thanks to its simple pathway and plethora of benches where you can sit and enjoy the view. At just over 1,300 square feet, Northlake Park is about half the size of the average single-family home. What it lacks in surface area, it makes up for in peaceful alone time. Hidden just outside the I-5 overpass, it can be difficult to spot. Once you find it, though, it’s well worth a visit for the opportunity to watch the boats in Lake Union. This quaint grassy slope is located in the Capitol Hill neighborhood. Bellevue Place overlooks the I-5 Expressway rather than being concealed by it like most of Seattle’s secret parks. The vantage point offers amazing views of Lake Union, and a short bike path runs through to the bottom of the hill. The Duwamish tribe named this park Me-Kwa-Mooks, which translates to “shaped like a bear’s head,” back in 1851. Most of the park stretches up the hillside and runs both north and south on land that is largely undeveloped. Creatures from the land and sea call Me-Kwa-Mooks Park home thanks to the dense trees and tide pools located just across the street. 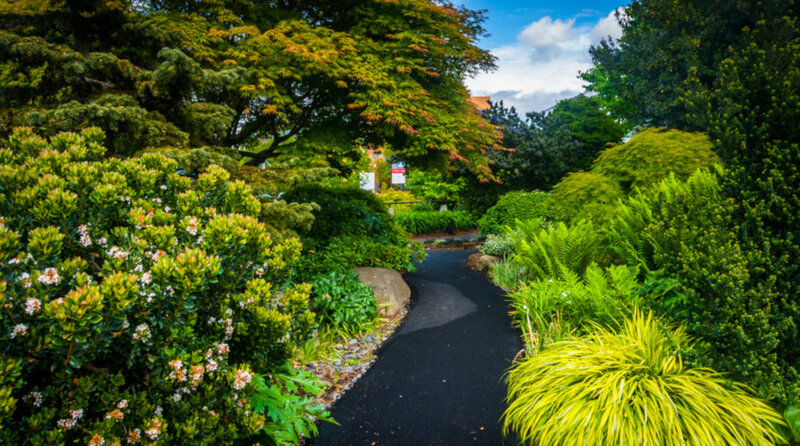 This historical, pocket-sized park was a gift to the city from the Yesler Logging Company in 1909. It is a beloved park in the Lowman Beach Community with a few surprising amenities. The park offers a tennis court that is practically on the beach as well as a few swings for kids and a grassy field for picnicking or playing. Thomas C. Wales Park resides in an area that was once a downtown gravel quarry. Seattle Parks and Recreation and the Office of Arts and Cultural Affairs worked together to select an artist to help design the space. Today, uniquely beautiful rock structures are scattered through the park as an homage to what previously occupied the land. A small pond rests in the center of the park, which makes it an ideal spot for birds. With plenty of benches, this park is the perfect spot to decompress after a long day at work or to simply pass the time. Bhy Kracke Park is easily the most unusual park in Seattle because someone could happen upon it unexpectedly while wandering through the Queen Anne neighborhood. The park also boasts one of the best views in the city. Great views of downtown, Lake Union, the I-5 freeway and Capitol Hill greet anyone who stops by. The park is furnished with benches, a bike rack and a drinking fountain should you want to stop for a while and take in the scenery. Take a stroll down the steep, densely manicured hill for more beautiful views and enjoy a surprise play area for kids. Just above Volunteer Park on Capitol Hill is a serene and stunning observation point known as Louisa Boren Lookout. The breathtaking view of Lake Washington and the Cascades is sure to stop you in your tracks when walking along the path that runs through the park. Take a seat on one of the many benches to snap a few photos or relax and watch the sun set or rise. Continental Van Lines has served the people of the Pacific Northwest since 1952. Though we have grown into a full-service company, we are proud of where we began. We’ve come a long way and are now proud to offer residential, Alaska and international moving services for our customers. If you plan to move soon, contact us online or call (206) 937-2261 today for your FREE moving quote!